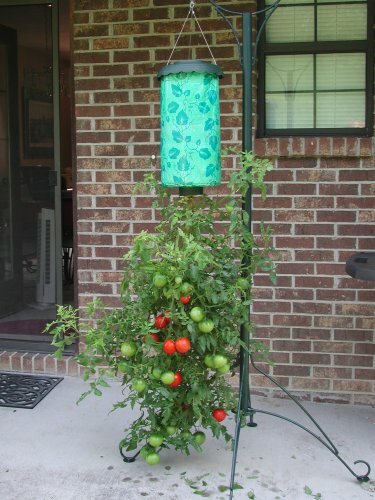 Ingenious tomato planter turns gardening upside down! Thanks to a whole new direction in growing tomatoes, your crop will be bigger, better tasting, healthier, and easier to grow than ever before. You can water, feed, trim and harvest without bending or kneeling–and since your crop is upside down and will never touch the ground, staking, caging, bacteria, ground rotting, fungus and small animals become problems of the past. It’s the perfect gift for any gardener. Great for those who live in apartments or who have small backyards. 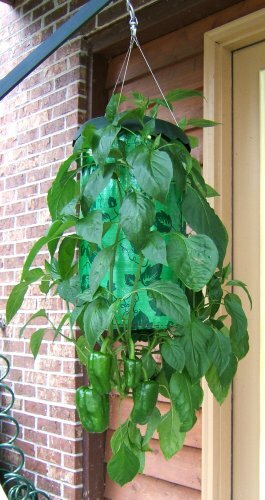 Water and fertilize through the built-in top funnel; trim and harvest at chest height! Also for cukes, peppers, flowers. Just add your soil and plants. Topsy-Turvy¿ Planter makes it easy to grow tomatoes and vegetables because it eliminates the need for a backyard garden plot.